You may have already heard whispers (or cries) about the new G Suite pricing for basic and business editions. Today we’re bringing you some details to clear things up. Last week, Google announced that it will be raising the price of G Suite subscriptions for the first time since its creation over a decade ago. 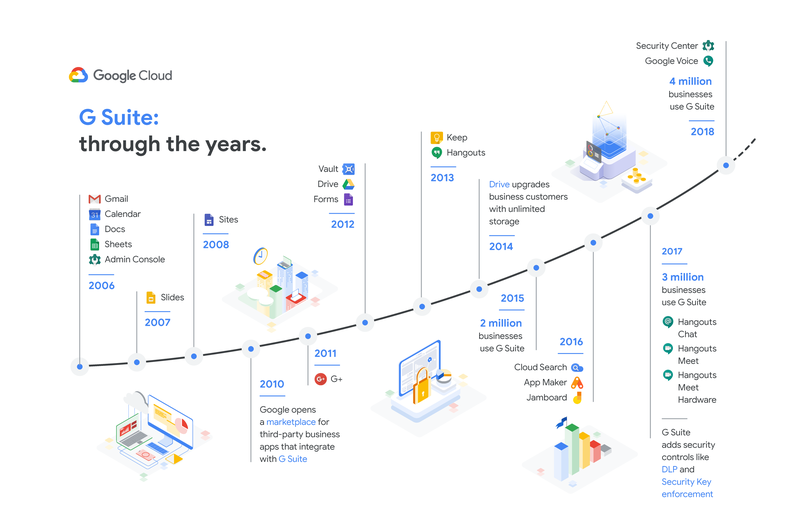 Over the past ten years, Google has constantly innovated to bring businesses more than a dozen new G Suite services to help them reimagine how they work. The company has continued to add new, more powerful services and features within the Google apps suite, including video conferencing (Hangouts Meet), secure team messaging (Hangouts Chat), enterprise-grade search capabilities (Cloud Search), and more storage space. Today they’ve even introduced features using advanced artificial intelligence to simplify and automate email responses, gather insights from data, and protect against phishing attacks before they happen. While you’ve continued to benefit from the ever-improving versions of G Suite, the one thing that has remained unchanged in the past ten years, is pricing. G Suite Basic Edition will increase by $12 annually, or from $5 USD to $6 per user per month. G Suite Business Edition will increase by $24 annually, or from $10 USD to $12 per user per month. Pricing for G Suite Enterprise Edition customers will remain the same. G Suite Basic Edition will increase by €22.40 annually, or from €3.33 to €5.20 per user per month (for a total of €62.40 per user per year). G Suite Business Edition will increase by €28.80 annually, or from €8 to €10.40 per user per month (for a total of €124.80 per user per year). For G Suite Basic or Business version Customers on the Flexible Plan, new prices will go into effect on April 2, 2019. For Annual Plan Customers, new prices will go into effect the first time their plan renews on or after April 2, 2019. If you begin an annual or multi-year contract before April 2nd, or have a renewal event prior to this date, you will be eligible to maintain the current pricing. As a premier Google partner, we encourage you to consult with our team to discuss the specifics of your account. We’ll help you make a detailed assessment of your G Suite usage to better estimate what’s best for your business needs, including choosing the right G Suite product and number of licenses. While price increases never make for pleasant news, Google has continued to innovate and add value to their G Suite product line since its creation in 2006. We at Revevol are confident that these price increases will allow Google to further enhance these features and continue to upgrade, empowering your teams to work collaboratively in real time using tools they depend on most throughout the day. Revevol remains committed to accompanying you on your G Suite journey and helping your business get the most out of your G Suite experience. For more information, see the official Google Cloud blog post announcing the upcoming changes.